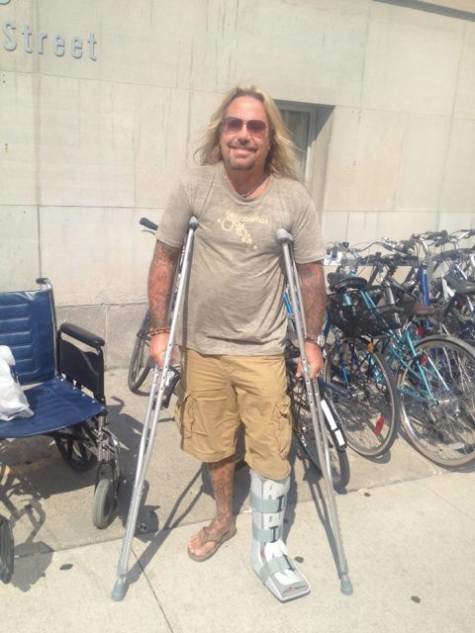 Motley Crue singer Vince Neil broke his left foot during a concert Wednesday night in Cuyahoga Falls, Ohio. Currently touring with KISS, the Crue frontman reportedly tripped on stage but managed to finish the show. "Cleveland tonight,” tweeted Neil after the show. “Paramedic's think I broke my foot. I hope not. Getting X-ray tomorrow in Toronto. Thanks Cleveland for understanding!!" 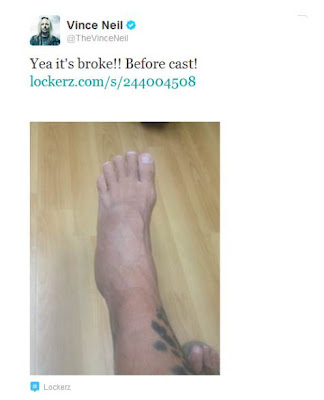 The singer posted a photo showing his swollen left foot before a cast was put in place; he followed that up with a shot on crutches with a protective walking boot. The KISS/Motley Crue North American tour has a few shows left before it wraps up September 23 in Hartford, CT.